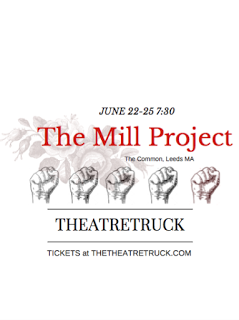 TheatreTruck presents THE MILL PROJECT: an exploration of women’s bodies in labor and resistance in the age of industrialization. This performance, featuring five local actors, was devised by the ensemble using historical research to launch an investigative and creative process. The Mill Project is the result this exploration into the first generation of American women who worked outside the home: their freedoms and exploitations, their strengths and the dangers they faced, and the expectations society held for them. Using original music, movement and primary source text, The Mill Project puts the “mill girls” of factory towns like Leeds and Lowell into relationship with the experience of American women today. The Mill Project was conceived by TheatreTruck cofounders Brianna Sloane and Elizabeth Pangburn and created by Sloane and Pangburn with Emily MacLeod, Emma Ayres, Christine Stevens, Jayme Winell, Robyn Sutton- Fernández, Maya Lapping Rivera and Julia Read. Performances June 22-25 at 7:30pm on the Leeds Common across from the historic Nonotuck silk mill. The audience is invited to bring a blanket or chair and picnic. This performance is recommended for ages 14 and up. Tickets available at Brown Paper Tickets: $20 in advance ($15 students/seniors in advance) or $25 cash only at the door ($20 students/seniors). Performances June 22-25 at 7:30pm on the Leeds Common across from the historic Nonotuck silk mill. In the event of heavy showers or storms, Rain Date Friday June 30. Parking is available in the Chartpak lot. Site is accessible. No facilities are available. This program is supported in part by a grant from the Northampton Arts Council, a local agency which is supported by the Massachusetts Cultural Council, a state agency, and with support from the Leeds Civic Association and the Bement School.